A massive thanks goes to Iain for capturing such brilliant photos of a very memorable flight. Rolling on RWY 06 at Camden. 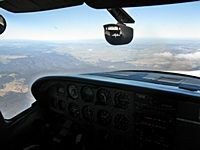 N over Lake Burragorang (colliery to the right). 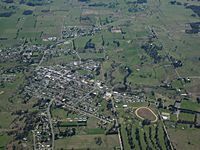 Approaching Taralga. Looking S along the Cookbundoon Range (distant, left of centre). Descending through the cloud layer. Long final for Temora RWY 18.
Business end of a Hornet. Returning to the aeroplane past a Harvard/T-6 Texan. 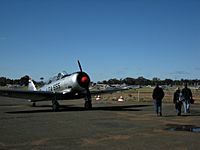 Queuing for departure from Temora. Departing overhead the aerodrome and museum. 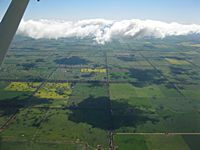 Canola crops to the SE of Temora. Climbing past the cloud layer. Looking N towards Mt Canobolas (left horizon) and Mt Macquarie (left of centre horizon) from near Boorowa. Looking S towards Lake George (right of centre) from near Boorowa. All's well. Ground speed around 160 knots. Devil's Slide (up, left of centre) and Guinecor Creek near Taralga. The Wombeyan Caves Road follows the main Dividing Range. Looking NE towards Burragorang from overhead Wombeyan Caves. Wombeyan Caves with the Figtree Cave entrance visible bottom centre. Wollondilly River with the Wombeyan Caves road approaching Goodman's Ford (bottom right to image centre). Lower Wollondilly and the sandstone cliffs. Looking NE approaching Lake Burragorang's southern end. Lake Burragorang with the Wollondilly entering bottom left. Looking N along Lake Burragorang and Burragorang walls. Joining upwind 06 at Camden. Final approach RWY 06 at Camden.